The coated variety is called "Powder Puff," and is a recognized type. This breed is considered small; 10–13 lb (4.5–5.9 kg). At first look, the Hairless and Powderpuff varieties of Chinese crested dogs appear to be two different breeds, but hairlessness is an incomplete dominant trait within a single breed. The Hairless has soft, humanlike skin, as well as tufts of fur on its paws ("socks") and tail ("plume") and long, flowing hair on its head ("crest"). In addition to being an incomplete dominant gene, the "hairless" gene has a prenatal lethal effect when homozygous. Zygotes affected with double hairless genes (1 in 4) never develop into puppies, and are reabsorbed in the womb. All hairless Cresteds are therefore heterozygous. The Hairless variety can vary in amount of body hair. Fur on the muzzle, known as a beard, is not uncommon. A true Hairless often does not have as much furnishings (hair on the head, tail, and paws). The difference between a very hairy Hairless and a Powderpuff is that the Hairless has a single coat with hairless parts on the body, while the Powderpuff has a thick double coat. The skin of the Hairless comes in a variety of colors, ranging from a pale flesh to black. Hairless Cresteds often lack a full set of premolar teeth, but this is not considered a fault. A Powderpuff has a long, soft coat. Both Hairless and Powderpuff varieties can appear in the same litter. The look of the Powderpuff varies according to how it is groomed. When its fur is completely grown out on its face, it strongly resembles a terrier; however, the Powderpuff is usually shaved around the snout as a standard cut. The Powderpuff Chinese crested dog is an elegant and graceful dog who makes a loving companion, playful and entertaining. The Puff's coat is long and silky soft. Ears are large and erect. The amount of body hair on the Hairless variety varies quite extensively, from the true hairless which has very little or no body hair and furnishings, to what is called a "hairy hairless", which, if left ungroomed, often grows a near-full coat of hair. These hairy hairless are not a mix between Powderpuffs and Hairless Chinese crested dogs, but are merely a result of a weaker expression of the variable Hairless gene. The mutation responsible for the hairless trait was identified in 2008. Both varieties require certain amounts of grooming. The Powderpuff is entirely covered with a double, very soft, straight coat. Although a Puff's coat does not continuously grow, it can grow to be quite long at full length. A weekly bath & frequent brushing will help prevent matting. For an optimal coat, never brush when dry or dirty. A light spray of water, or grooming spray to their coat is recommended before brushing. Many choose to shave their Puff in a "Pony Cut" leaving long hair on bottom of legs, tail, head and crest for an easy care coat. Puffs are very clean and have no odor. This breed has "little to no shedding". (see Moult). Maintenance of the Hairless variety's skin is similar to maintaining human skin and as such it can be susceptible to acne, dryness, and sunburn. Hypoallergenic or oil-free moisturizing cream can keep the skin from becoming too dry when applied every other day or after bathing. Burning can occur in regions that are subject to strong UV radiation, especially in lighter-skinned dogs. Many owners apply baby sunscreen to their pets before spending time in strong sun. Some Cresteds have skin allergies to Lanolin, so be cautious when using any products that contain it. Unless the dog is a "True" Hairless (one with virtually no hair growth on non-extremities), trimming and/or shaving is often performed to remove excess hair growth. The Chinese crested dog is further distinguished by its hare foot, (having more elongated toes) as opposed to the cat foot common to most other dogs. Because of this the quicks of Cresteds run deeper into their nails, so care must be taken not to trim the nails too short to avoid pain and bleeding. 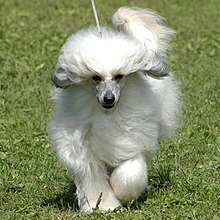 Powderpuffs enjoy getting outdoors for daily exercise, although they are not a high energy breed. They are great for apartment or city living, but being very versatile, also love country living and long hikes. Being a very intelligent breed, this dog does well in obedience type sports. Consistency is a must, however this breed can be relatively sensitive and should have a gentle trainer. The Powderpuff is great at learning and performing tricks. The Powderpuff is not affected by many of the congenital diseases found in other toy breeds. They are, however, prone to some of these conditions listed. Eye problems such as lens luxation, glaucoma, and PRA (Progressive Retinal Atrophy), luxating patellas, and Legg-Perthes disease. The Powderpuff should have full dentition, not missing or crooked teeth, as is accepted in their sibling the Hairless variety. Cresteds have what is called a "primitive mouth." This means that most of their teeth are pointy, like their canines. Hairless varieties of the Cresteds can be prone to poor dentition. Poor dentition may include missing or crowded teeth and teeth prone to decay when not properly cared for. Most dogs of the Puff variety have few, if any, dental defects. Eyes are a concern within the breed, with many suffering from a painful and blinding inherited eye disease called Primary Lens Luxation (PLL). The Chinese Crested can also have at least two forms of progressive retinal atrophy (PRA) which can eventually lead to blindness as well. For PLL and also one of the forms of PRA, there exists a genetic test, to determine if a dog is a "carrier, clear, or affected." prcd-PRA. Since the test for prcd-PRA can only reveal the existence of affected or carrier status of this one form of PRA, breeders and owners of the breed should still have regular eye exams by veterinary ophthalmologists. The breed also suffers from another eye disease called Keratoconjunctivitis sicca or dry eye syndrome (DES). Along with Kerry Blue Terriers, Cresteds can develop canine multiple system degeneration (CMSD) also called progressive neuronal abiotrophy (PNA) in Kerry Blue Terriers. This is a progressive movement disorder that begins with cerebellar ataxia between 10 and 14 weeks of age. After 6 months of age, affected dogs develop difficulty initiating movements and fall frequently. The gene responsible has been mapped to canine chromosome 1. As with all other toy breeds, the Cresteds can be prone to patellar luxation. This inheritable condition is caused by shallow knee joints (stifles) and results in kneecaps that pop out of place. Its onset is often at a young age, and can cause temporary to permanent lameness based on the severity. Breeders should have their stock certified free of patellar luxation. Many countries' kennel clubs maintain a centralised registry for health results. Allergy and autoimmune diseases have been observed in the breed. The severity of these ailments, which can lead to the premature death of the dog, means this is something breeders need to take seriously in order to avoid it becoming a problem for the breed. Although hairless dogs have been found in many places in the world, it is unlikely that the origins of the modern Chinese crested dogs are in China. The breed was believed by some to have originated in Africa and was called the African Hairless Terrier in several 19th century texts, however, there is genetic evidence that shows a shared origin with the Xoloitzcuintli. The current name of the breed likely comes from their use on Chinese ships as ratters. They are also believed to have been bred as a companion for people living with an intellectual disability and as such can remain healthy with little exercise. In the 1950s, Debora Wood created the "Crest Haven" kennel and began to purposefully breed and record the lineages of her Chinese crested dogs. The famous burlesque dancer Gypsy Rose Lee also bred Chinese crested dogs, and upon her death her dogs were incorporated into Crest Haven. These two lines are the true foundation of every Chinese crested dog alive today. Ms. Wood also founded the American Hairless Dog Club in 1959, which was eventually incorporated into the American Chinese Crested Club (ACCC) in 1978. The ACCC became the US parent club for the breed when the Chinese crested dog was recognized by the American Kennel Club 13 years later, in 1991. The Chinese crested dog was officially recognised by the Fédération Cynologique Internationale in 1987, by The Kennel Club (UK) in 1981, by the American Kennel Club in 1991, and by the Australian National Kennel Council in 1995. The Hairless allele (the wild type) is a dominant (and homozygous prenatal lethal) trait, while the Powderpuff allele acts as a simple recessive trait in its presence. Zygotes that receive two copies of the Hairless allele will never develop into puppies. Thus all Chinese crested dogs carry at least one copy of the Powderpuff allele. 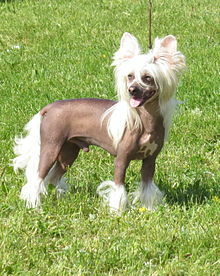 The Powderpuff trait cannot be bred out because it is carried by all Chinese crested dogs (even the hairless ones). All Hairless Chinese crested dogs have the ability to produce Powderpuff puppies, even when they are bred to another Hairless. On the other hand, a Powderpuff bred to another Powderpuff can never produce hairless puppies, since they do not carry the Hairless gene. ^ a b "Fédération Cynologique Internationale breed standard" (PDF). Fci.be. Retrieved 2011-09-27. ^ "Hairless dogs". Caninebreeds.bulldoginformation.com. Retrieved 2011-09-27. ^ Drogemuller, C.; Karlsson, E. K.; Hytonen, M. K.; Perloski, M.; Dolf, G.; Sainio, K.; Lohi, H.; Lindblad-Toh, K.; Leeb, T. (2008). "A Mutation in Hairless Dogs Implicates FOXI3". Science. 321 (5895): 1462. doi:10.1126/science.1162525. PMID 18787161. ^ Dogs that do not shed. Go Pets America. Retrieved September 7, 2008. ^ "prcd-PRA Test for Chinese Cresteds". Optigen.com. 2007-06-19. Retrieved 2011-09-27. ^ D. P. O'Brien, G. S. Johnson, R. D. Schnabel, S. Khan, J. R. Coates, G. C. Johnson, and J. F. Taylor. "Genetic mapping of canine multiple system degeneration and ectodermal dysplasia Loci". Journal of Heredity 96 (7):727–34, 2005. ^ "Orthopedic Foundation for Animals (OFA)". Offa.org. Retrieved 2011-09-27. ^ "Chinese Crested Dog". 2puppies.com. Retrieved 18 May 2016. ^ Fernandez, Amy; Rhae, Kelly (1999). Hairless Dogs, The Naked Truth. Kelly Rhae. ISBN 0-9672160-1-X. ^ "Discover Magazine". Blogs.discovermagazine.com. 2008. Retrieved 2011-09-27. ^ "American Kennel Club Breed Standard". Akc.org. Retrieved 2011-09-27. ^ "Under-bite helps Pabst become World's Ugliest Dog". Boston.com. Associated Press. 28 June 2009. Retrieved 27 August 2012. Wikimedia Commons has media related to Chinese Crested Dog. This page was last edited on 20 March 2019, at 13:27 (UTC).